Lunar Touch for iOS releasing this week. Re: Lunar Touch for iOS releasing this week. Shiva Indis wrote: According to the app store, the game should have a Japanese language option. Can anyone confirm this? Vay, which was done by Somoga, seems to have only been released in USA and then a bit later in Europe! It's likely that the same will go for Lunar. and I noticed that Lunar is the only game I've played that shows low frame rate! I have some games that are full 3D, and 2D games that are probably emulation or ports, but they work very smoothly if not perfect on a gen 4 iPhone. But the frame rate in Lunar looks like almost half as smooth as them, as if the system wasn't powerful enough. D: Anyone noticed? And the menu is glitchy too, I hope an update can fix that. 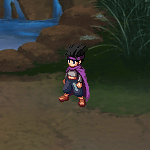 *When using magic on a character, and select the character with the d-pad, the cursor just doesnt seem right. Also, the character moves a little too fast! It's the same speed as the original game, but too fast for an iphone to control easily. A walk/run option would be good but that's just hoping for too much. It's not available on the Japanese iTunes Store (atleast, not presently). I know this was discussed with Vay, the framerate is intentionally reduced (maybe 30fps instead of 60fps or something) on a lot of devices as this massively extends batterylife. DevNall wrote: I know this was discussed with Vay, the framerate is intentionally reduced (maybe 30fps instead of 60fps or something) on a lot of devices as this massively extends batterylife. That makes sense! The other games really drain the battery life of the iPhone. But still, it would be nice if I could select it on the settings. There is a settings menu in the main screen of Lunar before you load your game, but its disabled so I can't select it. Does Vay have an option to select battery-friendly setting or not? You know what, I'm going to start another thread for update suggestions, if you want to add that there.